There is nothing quite like picking sun ripened strawberries right off the plant the way God meant it to be. 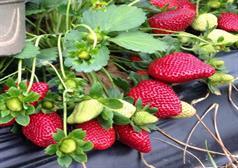 Visiting at our PICK YOUR OWN strawberry field can be a wonderful experience to share with your family and friends. But it is not just about strawberries-it’s about a way of life. Reconnecting to the land and each other. 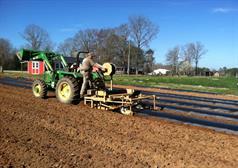 Each year the PICK YOUR OWN schedule varies due to the South Carolina Midlands weather and crop abundance. Our season generally runs from April to June. Please come suitably attired for picking strawberries. We suggest appropriate footgear like sneakers, boots, other closed toe, and no heels shoes. Be prepared to walk to where the best picking is in the field. Bring a hat and sunscreen for the sunny days. Not up to the Pick your Own experience, we’ve got you covered! Pick up a basket of fresh picked in our farm market and while your there check out all our fresh produce, gluten-free baking mixes, fresh milk, eggs and signature meats, like our bacon, pork chops and onion sausage for to true farm to table experience! A one-cup serving size of strawberries has only 46 calories and more Vitamin C than a medium orange. Strawberries are also rich in antioxidant compounds that many help protect against cancer and support memory, heart and urinary tract health. 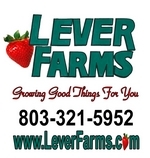 The best strawberries are the ones you pick yourself or buy from our strawberry farm. These berries will be the freshest you can get, with little or no handling and travel. Nothing beats the flavor and fragrance of fresh-picked strawberries! Pick by pinching the stem of the berry between your thumb and forefinger. This will prevent damage to both the fruit and the strawberry plant. Leaving the caps on helps your strawberries last longer. When selecting berries look for the ones that are plump, firm, and well colored. A tip to remember: THE REDDER THE BETTER. These are the best berries for all your needs--freezing, preserving, or eating just the way they are. Whole berries: Place one layer of clean, capped berries on a cookie sheet and freeze until firm. Remove from cookie sheet and package in freezer bags. Sliced berries: Slice berries in halves or quarters. Add ½ cup sugar (or less to taste) per quart of berries. Stir and allow the mixture to stand until sugar dissolves (about 15 minutes). Pack the fruit and juice into freezer bags or containers. Leave ¼ inch head space for pint containers. Sugar is not necessary for freezing but will help preserve color and texture.